Materials: A large needle. The best naalbinding needles are made of antler or bone, but a large tapestry blunt will work. The basic stitch: Start by making a loop in the yarn. 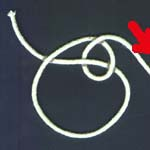 The red arrow marks the end of the yarn where the needle is.